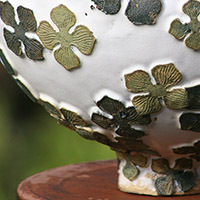 Tracy has always had a great passion for ceramic work, but had never touched clay before. 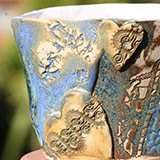 In the summer of 2014 she began to attend a workshop at Alby Crafts under the guidance of Helen Dixon. 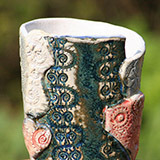 And she was hooked! 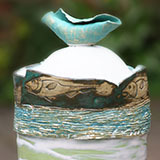 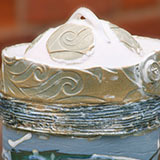 Since then she has become a regular pupil and since February has been assisting Helen run raku workshops. 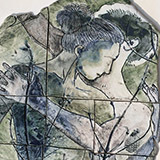 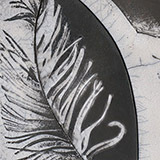 Originally she intended to use clay as a new printing medium, for the creation of wall pieces. 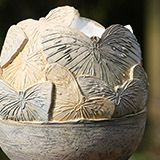 Certainly much of the work has impressed and incised content. 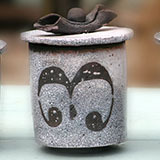 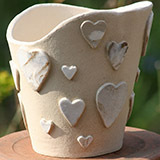 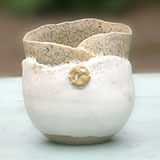 But Tracy has also become a keen maker of pinch pot tea bowls, slab pots and even functional cups and jugs. 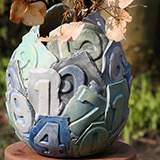 Recently she began throwing pots on the wheel - with quirky results! 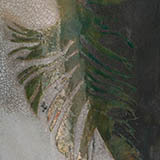 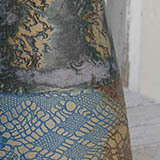 Much of Tracy’s work has been experimental. 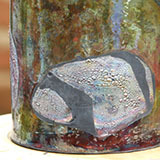 She often doesn't know what she is going to make when she begins and deciding on how to glaze a piece can be a challenge. 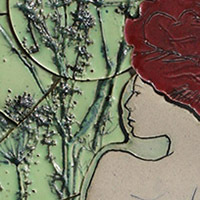 It would be fair to say it has taken over much of her creative life during the last year or so. 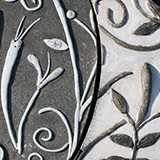 Claywork is an art slow in the mastering and not for the impatient. 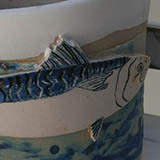 She uses mainly stoneware, crank and porcelain - often together in the same piece. 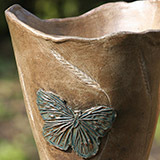 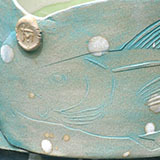 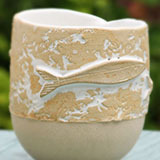 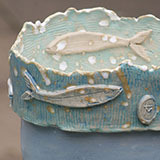 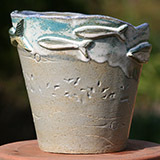 She impresses plant matter, found objects and hand made stamps to created the ceramic ware. 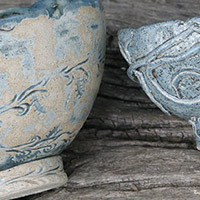 Some of the pieces shown here are for sale, but those which are not are included to showcase her progression. 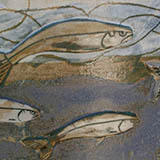 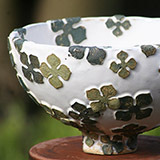 The raku work has been especially rewarding. 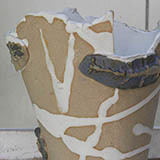 The risks are high. 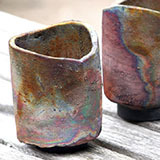 If it is not constructed well, the raku process puts the work through enormous strain - called thermal shock - and it may break. 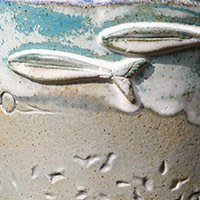 Instead of the usual slow firing of 16 or so hours for regular firing, glazed raku pieces are brought up to a white-hot temperature in about 30 minutes. 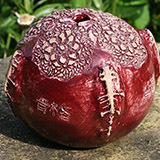 They are then removed with tongs and immediately plunged into sawdust where they combust, are smothered - thus cutting off the supply of oxygen - and left to cool. 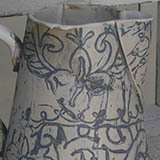 They can then be removed, cleaned of the sooty detritus and buffed up. 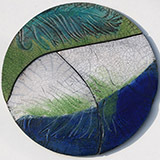 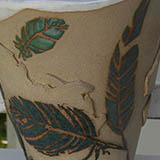 The results are breathtaking; amazing colours, blackened areas of bare clay and beautiful crackles in the glazes, like image 2 below - Green Feather vase.